Delivers quick and professional styling results with a glossy finish. 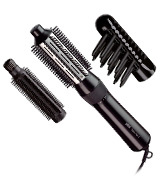 Thanks to the built-in ionic generator, the brush effectively removes frizz and static from hair. A professional tool with a multi-directional brush that can provide salon-like results in the comfort of your home. Has a cool option to help set the end result for a whole day. 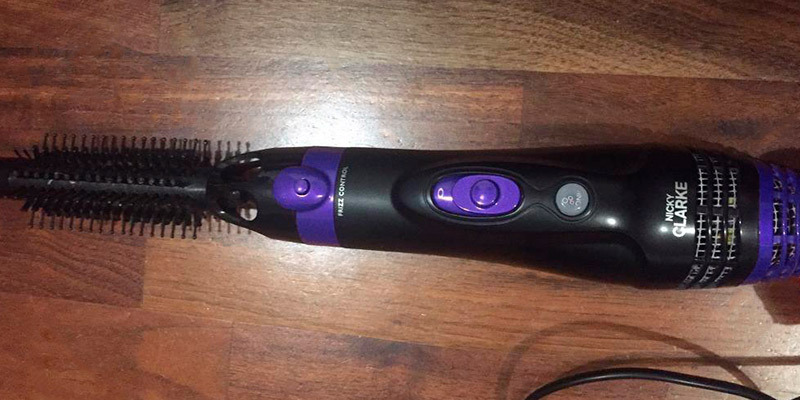 With 3 temperature settings, this styler is suitable almost for anyone. It is lightweight and convenient to hold in hands. The package includes a blow smart spray for damage-free hair styling. The operation is quite loud. Thanks to firm bristles and ionic conditioning, this brush will let you control even the most unmanageable hair and flyaways. Includes Keratin for the smoothest results. Perfect for styling, drying, and straightening. Comes with four attachments to suit different hair lengths and help create a variety of hairstyles. Has two speed settings, two heat settings, and a cool shot for a comfortable styling at home. Provides long-lasting results with no frizz and static. 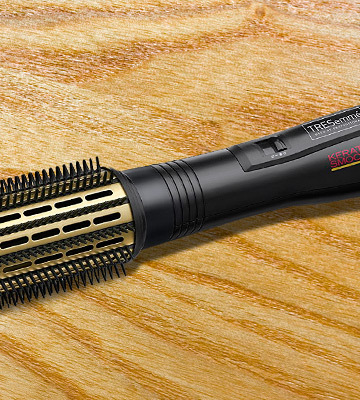 With the Remington AS7051, you will be able to create a perfect hairstyle within a minimum time. Using advanced technology and coming with a bundle of nozzles, the brush is extremely easy to use even for novices. 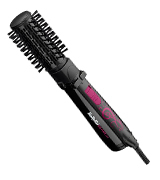 This powerful 1200Wblow dry styler comes with multiple attachments, so you can experiment with your looks. Fitted with a long swivel cord, it provides great manoeuvrability. Has 2 heat and 2 speed settings to suit different styling needs. Designed by salon experts who have over 30 years of experience in manufacturing hair products, you won't be disappointed with the Nicky Clare NHA045 air brush. It works incredibly gently on hair, doesn't cause any damage to it, and preserves its natural shine and look. 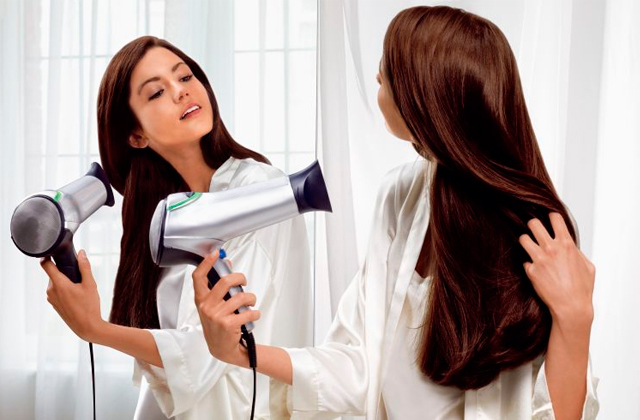 Styling your hair with the Braun Satin Hair 3 AS 330, the hair health won't be your concern. Thanks to the roll-out function and advanced ceramic technology, it enables you to style your hair without causing damage and absolutely tangle-free. The package includes 4 attachments for curls and straight look. Not as powerful as the other brushes. 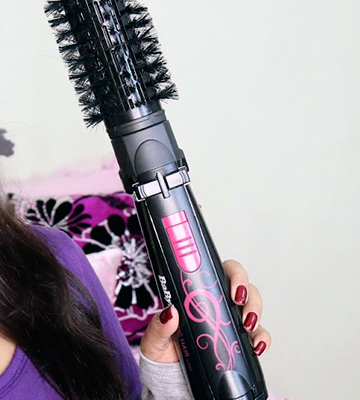 A great product which can easily replace a blow dryer, a curling iron, and a straightener. It's safe to use it on all hair types, including dyed, bleached, and brittle. 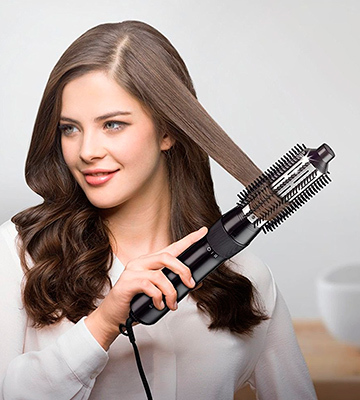 The BaByliss company introduces a brand-new model of a rotating styling brush that adds volume to your hair by adopting the technique of the world’s leading hairdressers. Thus, it has become easier to create salon hair styles even at home. 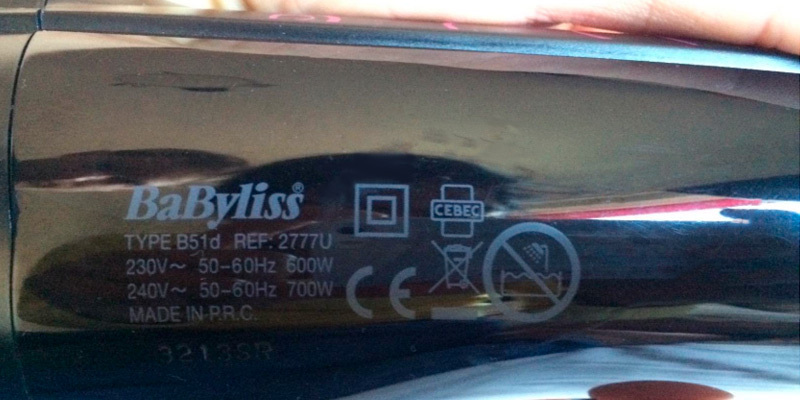 But what stands the BaByliss Big Hair styler out of the pack? Let’s have a look. To begin with, the BaByliss 2777U styler is equipped with a rotating barrel that functions as both a brush and a powerful blow dryer to add volume for maximum effect. 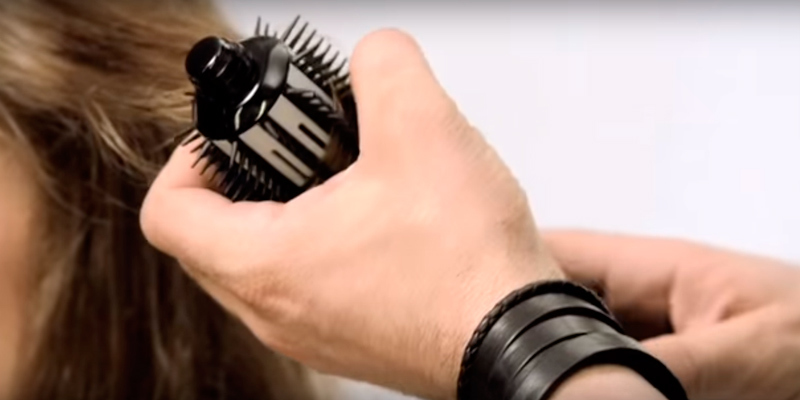 Being multi-directional, it can spin both clockwise and counter-clockwise enabling users to quickly switch directions while lifting and polishing hair from side to side. The process is easy to control by two large buttons on its handle. However, simplicity and flexibility aren't the only advantages of this rotating styling brush. 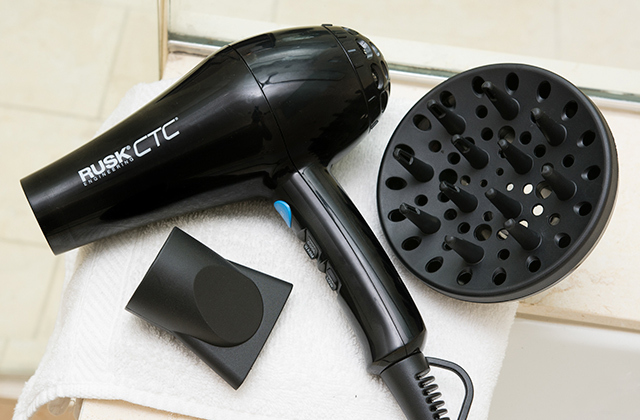 Thanks to its powerful 700W hair dryer, users can start setting their hair whilst it's still a little bit damp rather than sit and wait until it dries out completely. 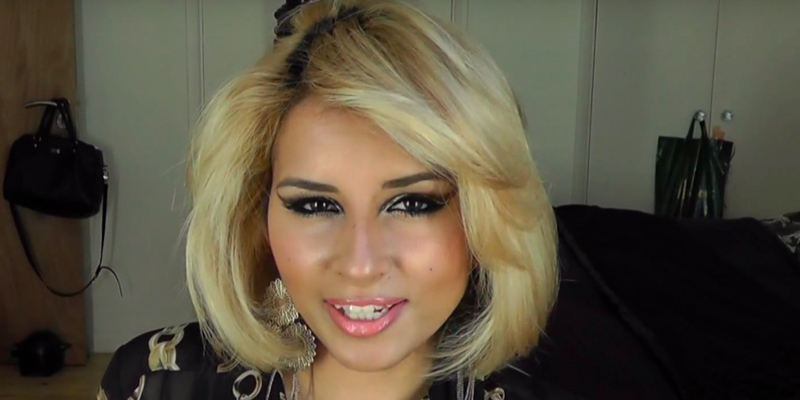 With that, you are able to create a full, voluminous look you like in less time. One more benefit of this 42 mm barrel is that it is ceramic and that it has soft bristles that carefully brush and lift hair adding body and fullness to it. 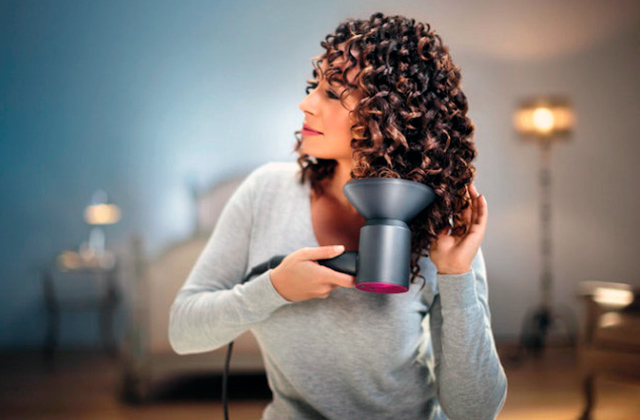 Along with this, the Big Hair styler features a built-in ionic conditioning system that saturates hair with negatively charged ions making it feel smooth and soft to touch with less static all day long. Whereas, styling your hair with a blow dryer won’t give you a similar result. 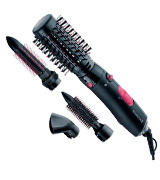 The Big Hair Styler offers 2 heat settings and a cool shot to suit your styling needs. You can use a high heat setting to dry your hair at first, or a low heat setting to start the styling process. The cool shot will help set the overall look. The speed of the brush head rotation can be set to either low or high. To achieve maximum effect it is recommended to stop the rotation when the styler is set to cool shot. 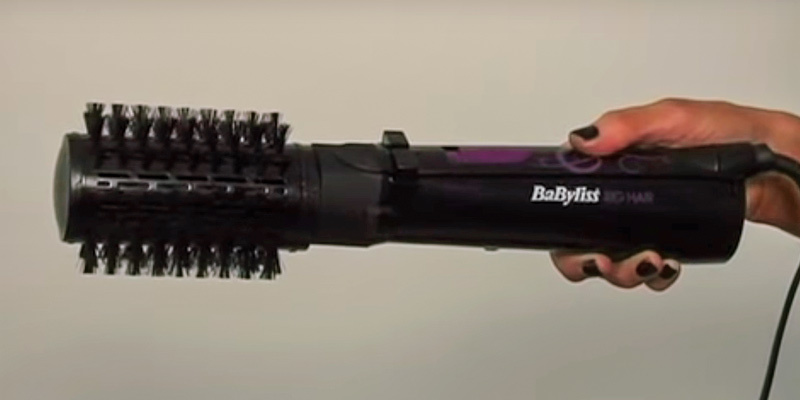 The BaByliss Big Hair styler is durable product of high quality with a hinged rear filter that's easy to clean. There is also a safety cover that can be placed over the brush head to protect the bristles and prevent them from falling off. The hair styling products from TRESemmé will help you leave your hair problems behind. Understanding that healthy and beautiful hair can often give women confidence, TRESemmé company developed a line of hair styling products that can help you create and experience with your looks whenever you want. For this review, we've picked an innovative Keratin Smooth Hot AirStyler with a 50-mm tourmaline-ceramic barrel suitable both for medium hair and for long hair. Like all hair products with a tourmaline-coating, this styler works gently on hair of all types and structures without pulling or tugging it and it heats up to the set temperature in mere seconds. A mixture of tourmaline in its barrel enhances styling results further by sealing the moisture inside the hair and saturating it with negative ions for a natural and healthy shine. As a result, your hair will look silky, shiny, beautiful and healthy. The TRESemmé Keratin Smooth Hot Air Styler has 3 heat settings, so you can choose the one that suits your hair type and length better. If your hair is thin or brittle, it's not recommended to style it at extremely high temperatures. And vice versa, if you have stubborn and coarse hair, you will not able to tame it unless you switch to the highest settings. 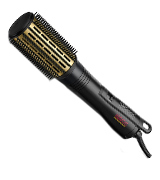 With the Keratin Smooth Hot Air Styler, however, consumers with all hair types will find their happy mean. To make hair styling easier, the barrel has firm bristles that help straighten hair, boost its volume and make it shinier. While a flexible 2.2-metre cord with a swivel base will provide you with a comfortable styling experience. The TRESemme Hot AirStyler comes with a brand KeratinSmooth Heat Protection Shine Spray, which you can use to fight frizz, detangle knots in the hair, enhance its shine, and manage flyaways. Spread the spray evenly onto slightly damp, towel-dried hair, comb it through and then style your with heat as usual. Control the most unmanageable locks and frizz using this fantastic duo from TRESemme. Facing a dilemma whether to go curly or straight? 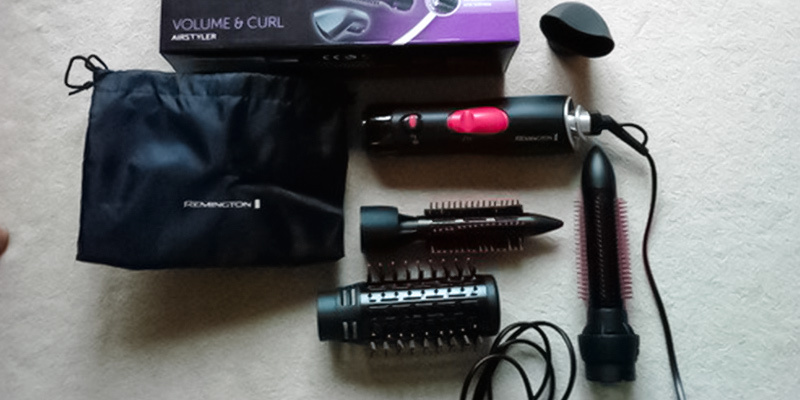 With the Remington Volume and Curl Air styler, you will be flexible enough to decide. The box alongside the styler contains whole 4 attachments for creating different looks - a 50-mm thermal volume brush, 21-mm thermal mixed bristle brush, 30-mm retractable bristle brush and a concentrator. 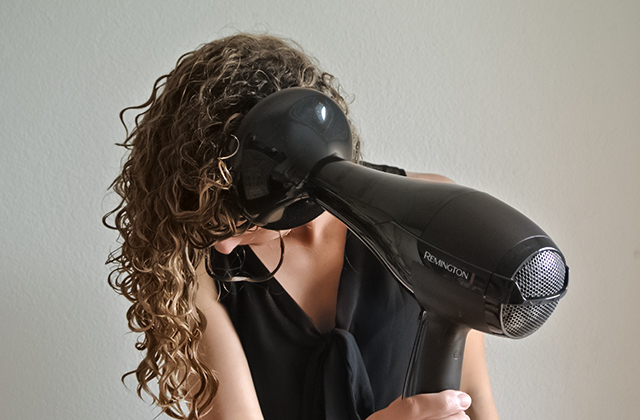 Thanks to the powerful 1000-watt motor, drying your hair with a concentrator will take very little time. And if you direct the airflow down the hair shaft, it will also make it look much more attractive and shinier than if you'd used a regular hair dryer. To help smooth natural curls and add coquettish volume and bounce, there's a 50-mm thermal volume brush which fits this purpose best. A 21-mm thermal bristle brush will help create small and perfectly shaped curls while a 30-mm thermal brush with retractable bristles will let you produce full, loose curls and classic Hollywood waves. All styling attachments are easy to use. Just click on and off to change a head. This 4-in-1styling kit has a lot more to offer. It features an advanced ceramic-tourmaline coating that effectively eliminates frizz and static in the hair and it uses ionic conditioning for adding extra shine and flexibility to the hairstyle. The brush has two heat and two speed settings, so you can choose the one that suits your hair type and can deliver the results you want. With a cool shot, you can set your hair when it dries. Fitted with a 360° rotation cord, the Remington AS7051 excludes all chances of tangling and allows you to get to the hard-to-reach areas helping you style your hair to perfection. As an added bonus, the package comes with a heat-resistant storage bag where you can store away your brush after usage even if it's still hot. With this bag, taking the brush along with you on travels will also be much more convenient. The production of Nicky and Lesley Clarke, which has been on the UK market for already more than 30 years, has brought them a big success, making them the leaders in the hair industry. According to Nicky and Lesley, their main goal is to help to inspire their clients, who are interested in hair and who buy their products, so they could look their best with their very own beautifully styled hair. The series of their hair products include those specially designed for managing frizz, a problem which a lot of girls have to deal with every morning. 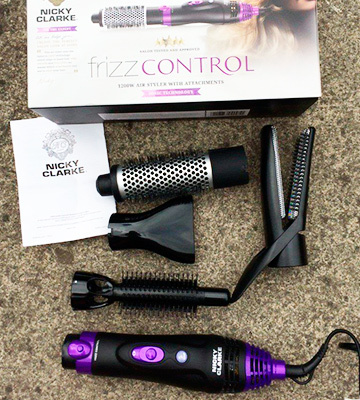 For this review, we've picked one of their most popular stylers for frizz control - the Nicky Clarke NHA045, a hot air brush that can reduce frizz, boost hair shine, and make it look incredibly smooth and attractive in a very short time. Using advanced ceramic and ionic technology, this styler can deliver perfect hairstyling results giving your hair plenty of volume. 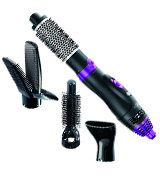 When buying the Nicky Clarke NHA045, you also get four attachments for creating different hairstyles. Use a large 38-mm thermal bristle brush to maximise your hair volume or a smaller 20-mm bristle brush to create light curls. 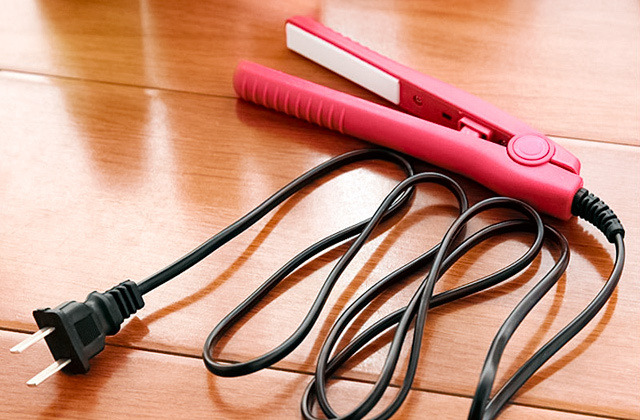 While if you'd like to make your hair straight, a straightener attachment will come in handy. Using a concentrator alone or in combination with any of the other nozzles will help you dry your hair quickly without the risk of overdrying it. 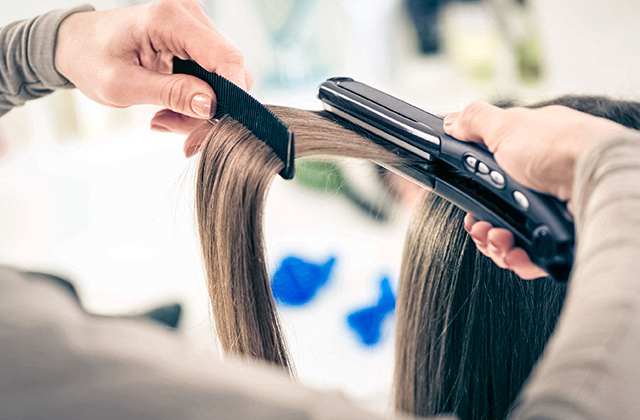 Some extra features of the Nicky Clarke NHA045 include two heat and two speed settings, which allows users with different hair structures and lengths choose the one that works for them better. It also comes with a 3-m tangle-free cord that provides freedom of movement during styling. All things considered, the Nicky Clarke NHA045 is a great tool to have to style hair with maximum comfort and with minimum frizz. Braun GmhB was founded in 1921 and since that time, it has been successfully functioning for 90 years, supplying its consumers with only good, qualitative, and reliable goods. 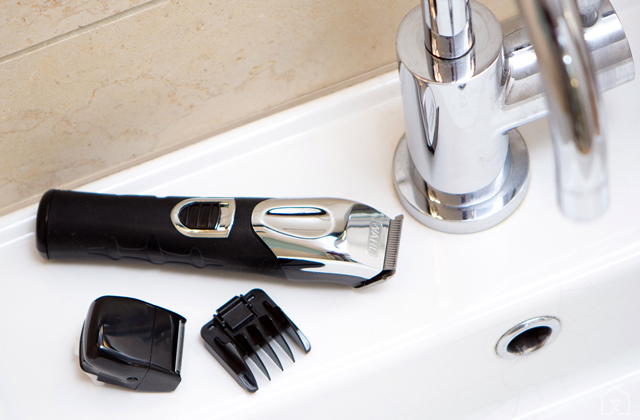 Braun's products include a great variety of goods from grooming devices to irons and watches. But today, we will speak about their beauty care products, and in particular, about their loved by many Braun Satin Hair 3 AS 330 hot air brush. This hot air brush will be a perfect choice for all women who love doing their hair, and who love doing it every day. 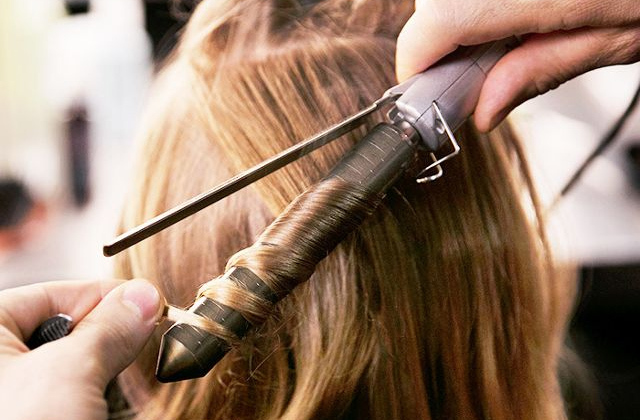 The brush works very gently on hair, glides smoothly over it, and maintains the set temperature throughout the whole treatment without overheating. Unlike cheap metal products, this brush heats up almost in an instant and the heat distributes evenly along its barrel and bristles without creating cold spots. The bristles thoroughly comb the hair while saturating it with negative ions for a better shine and gloss and in the end, the hair looks not only neat and well-groomed but also incredibly shiny and healthy. Thus, if you haven't made up your mind yet as to which hot air brush to buy, consider purchasing this innovative solution by Braun. With the Braun Satin Hair Air styler, you can create a beautiful hairstyle at home without visiting a hairdresser. Such attachments as a big brush, small brush, and a volume finger will help you with that. To create big curls, pick the big round brush; for making tighter curls, use the small one. If you want to get natural-looking curls like those you've seen on Hollywood celebrities, use a big brush first and then switch to a volume finger that delivers a voluminous look. Finish your hairstyle at the end. Without a doubt, this Braun Satin Hair Air styler is an excellent styling product for straightening, drying, and curling your hair. 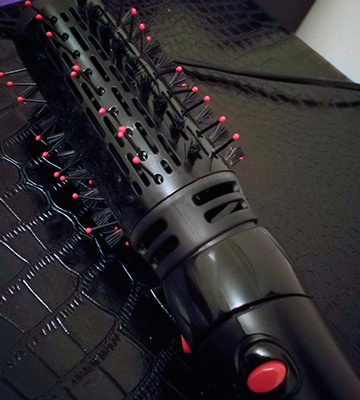 If you have fine hair and struggle to style it as it tangles easily, you'll be pleased to know that this styler has a roll out function that helps style hair without causing damage and tangle-free. 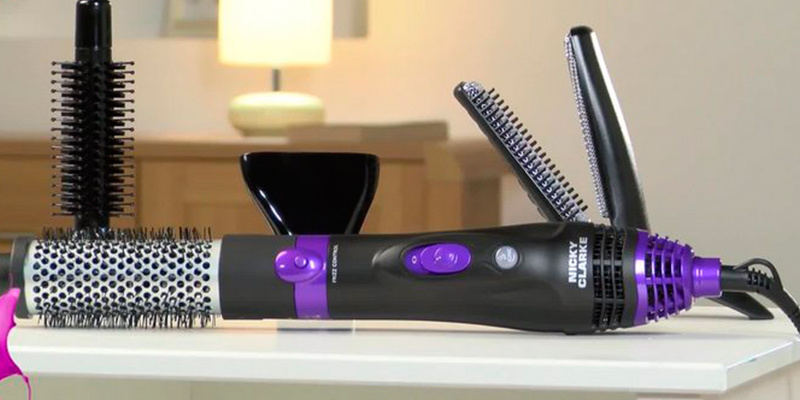 With two temperature settings, you will find the one to suit your hair type and prevent it from overdrying. 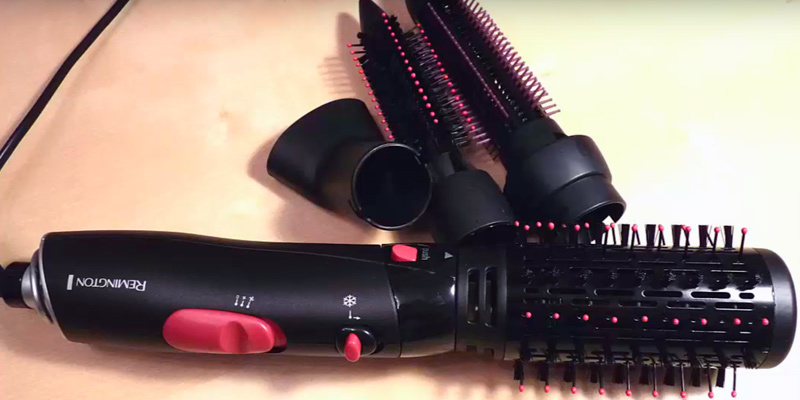 The most common way of doing a thorough comb-out both at home and in beauty salons is combining 2 styling devices - a styling brush and a hair dryer. However, if you've got no enough skill or you need to do your own hair, using two appliances simultaneously may become quite a challenging task. To solve this problem, the beauty market presented a new solution, combining the functionality of a brush and a dryer that you can get now in any store - which is a hot air brush. Millions of girls worldwide have already estimated the benefits of this versatile styler and given up on using other devices and now you have a chance to do it for yourself. By appearance, a hot air brush looks pretty much like a conventional brush, with the only difference between them that the former one has many tiny openings along the barrel, through which the hot air is supplied to style hair with heat. Hot air brushes are used for straightening hair, creating curls and waves, and adding volume. They are extremely versatile and can help create just about any hairstyle you could think of. However, the biggest advantage of hot air brushes is that they don't cause damage to the hair and the hair, in the end, looks extremely beautiful, natural, and healthy. However, if you do want to get rebellious or bouncy curls, you would probably still need to use some specialized appliances. Read our reviews on curling irons, straightening brushes, and flat irons and stock up on the things all girls should have in a drawer of their dressing tables. First of all, you should pay attention to the form, size and material of a styling attachment. The vast majority of thermo brushes come fitted with round barrels ranging in size from 1 to 2 inches. Here, the degree of curling is absolutely dependent on a styling barrel's diameter. Thin barrels are meant for making more intricate curls while barrels with a bigger diameter provide looser, more relaxed waves. Additionally, you can find hot air brushes with other styling attachments in a form of a bristle brush (perfect for roots lifting) or a variety of combs with a different length of the teeth (perfect for straightening). Different attachments offer you an option to experiment with your hairstyles and find the one that suits best your hair type, thickness and, of course, your looks. As regards the material a grill is made of, ceramic is the most popular coating. Ceramic heats up quickly and evenly distributes heat along barrel's surface, maintaining a constant temperature during the whole styling process. It means that the ceramic barrel reduces the amount of time you spend on setting the hair and thus, protects your hair from damage. But we should note that a tourmaline ceramic coating is known to be even better than an ordinary ceramic one. When heated, this material emits negative ions that have a positive effect on your hair since they combat positive ions that cause frizz. The negative ions lock in moisture and seal cuticles resulting in shinier and softer hair. There are also hot air brushes with a titanium ceramic coating available on the market. The combo coating has the same features as ceramic but is more resistant to chemical and mechanical damage and temperature drops. Power, temperature settings, and adjustable spin control are the next crucial features you should consider. As regards the power, everything is quite simple since the higher the power is, the faster your hair will be styled. Generally, a hot air brush with the power below 500 Watts perfectly suits women with short and shoulder length hair. If we speak about air brushes with the power of 1,000 Watts and above, these models can provide salon-like results in a comfort of your home even on long hair. 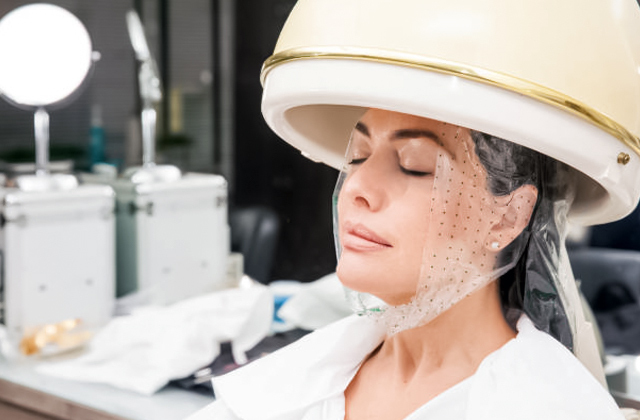 But don't forget that high temperatures increase the risk of hair overheating and may cause significant damage, so it is preferable to opt for a model with adjustable temperatures. Thus, you can choose between cool, low, med, high temperatures depending on your hair type or needs. 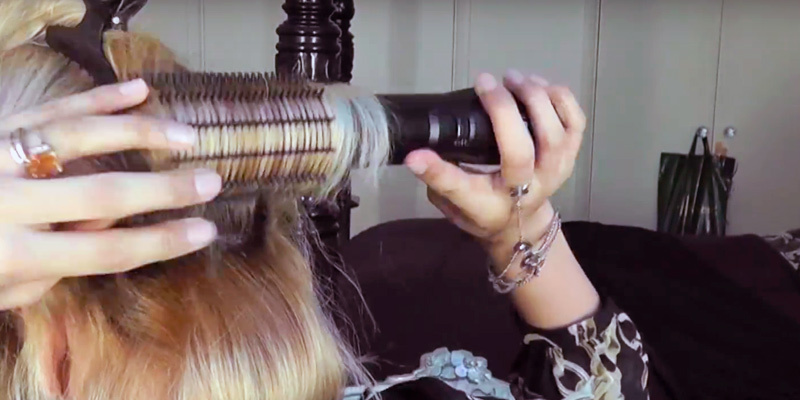 Another important feature for a convenient hairstyling is a spin control that allows turning a barrel to whatever direction you like for a specific curling effect. Finally, a hot air brush should have different features that make a tool maximally convenient to use. 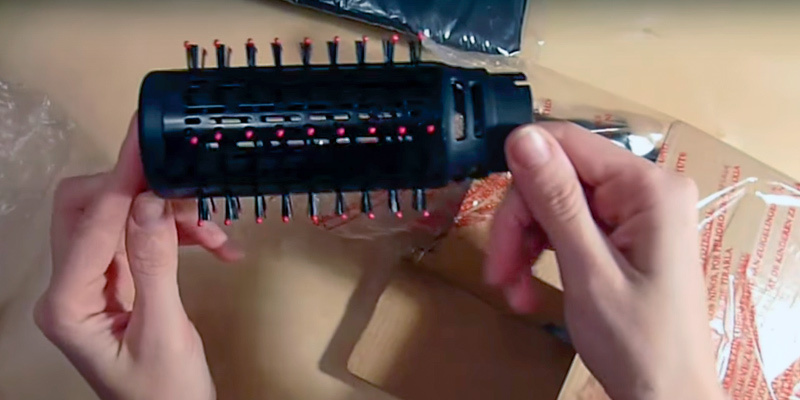 Choose a model with antistatic bristles and the tips that don't heat up. In such a way you will prevent hair tangling and will never burn your scalp. Additionally, some air hot brushes are designed with a removable filter that maximally simplifies a styling tool maintenance and prolongs the lifespan of a built-in motor. The usability of the device also depends on a cord length, the longer the better. Additionally, a cord with a 360-degree pivot will give you enhanced manoeuvrability during use. No need to say, a hot air brush must have an ergonomic handle, thus you will be able to use a tool for a long time and it will not cause a hand fatigue. All in all, if you travel a lot, it'd be handy to opt for a brush with a cover to protect brush bristles from damage during transportation. Q: Can hot airbrushes be used on damp hair? A: Not all of them, but most of the hot air brushes produced today can. However, before you apply yours to the hair, make sure to check the product's specs to see if it's suitable for that. 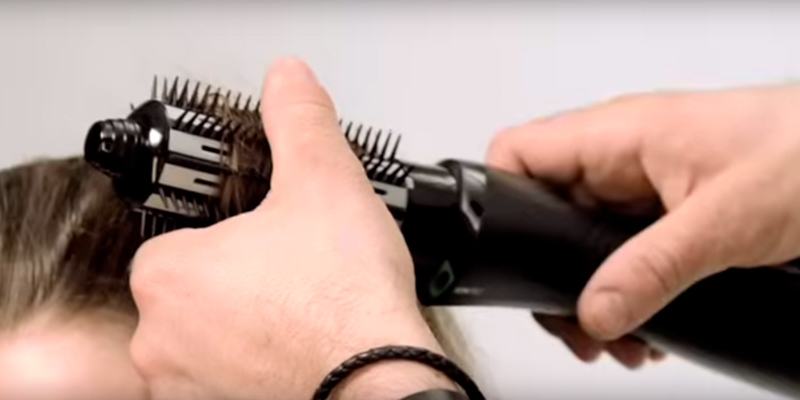 Most modern brushes come with built-in dryers that help dry hair while styling it. 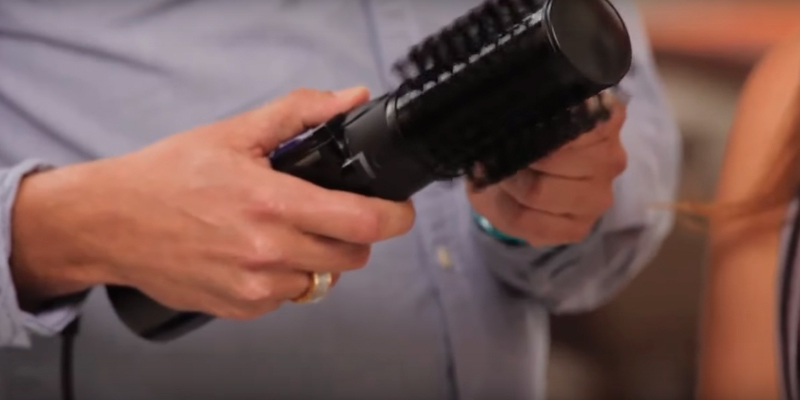 For better results, it's recommended to use an air hot brush when the hair is 70-80% dry. Q: Do hot airbrushes suit all hair lengths or not? A: Yes, they do, since all of them come with a few attachments of different diameters which can perfectly work on hair of different lengths and types. Q: Which is better, a rotating or fixed hot air brush? A: The main advantage of rotating hot air brushes is that you don't need to twist your wrist trying to get to the hard-to-reach areas. Although, a lot of users prefer fixed brushes over those that rotate and say they work better on long hair. We believe it's mostly a matter of habit. Probably you should try several versions and see yourself which of the two feels more comfortable in your hand. 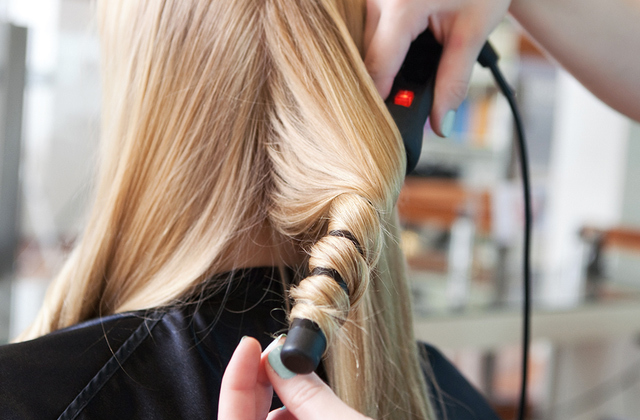 Q: How much time does it take to style hair with a hot air brush? A: Considering that it combines the functionality of two devices, the time required for hair styling is reduced almost by half. Q: Are they bad for hair? A: No, they aren’t. You just need to choose a hair brush that's right for you. Hot air brushes may have a coating of three types, which are chrome, ceramic, and tourmaline. If you fear of damaging your hair, we'd recommend you to invest in a brush a little bit more and get a product that will suit even brittle hair - a brush with a titanium coating. 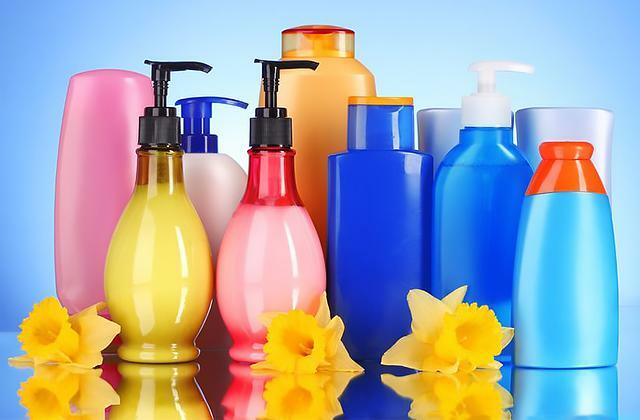 As of today, hair products with a titanium coating are known to be the safest of all available. Q: Can hot airbrushes straighten hair? A: Not all of them, but yes, some of them can. If that's what you want to use your brush for, make sure to pay attention to the bristles on the brush. They should be specially designed for this purpose. 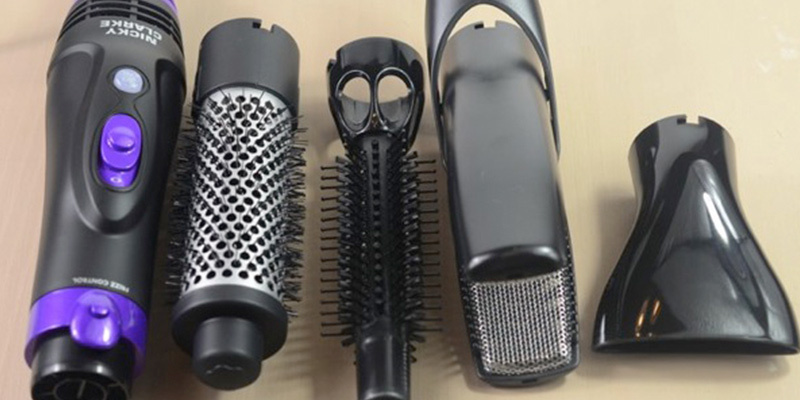 Q: Is it possible to buy any extra attachments for a hot hair brush? A: Unfortunately, not. All of them already come with a specific number of attachments and there are no other options to buy. 1. What Is a Hot Air Brush? wiseGEEK. 2. Lynn Wright How to choose the best hair styling tool, Saga Magazine. May 23, 2016. 3. Joanna Goddard A Hair Trick, A Cup Of Jo. May 6, 2014. 4. What Is a Hot Air Brush? drugstore. 5. How to Curl Hair Using a Hot Air Brush, wikiHow. 6. Jenny Strebe Old-Hollywood Curls: A Glamorous Hairstyle for the Holidays, MORE. 7. How to Keep Your Hair Healthy, wikiHow. 8. Amy Corbett Storch The Truth About Ions, Alpha Mom. 9. MEENAL Does Heat Protectant Really Save Your Hair? StyleCraze. September 20, 2016.